Your tot will be the most popular astromech droid in the galaxy in this cute toddler R2D2 costume. This little droid is made out of a soft polyester and flannel material. It has a detailed realistic design on the front and buttons on the back of the neck. The comfortable cap also has a detailed design which completes the look of this outfit. 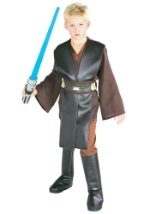 Create a fun Star Wars group Halloween costume when you add our child C-3PO and Luke Skywalker costumes for a cute Star Wars trio!